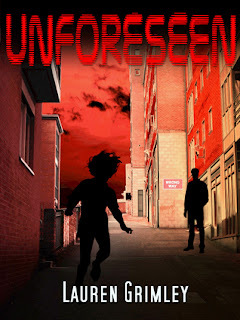 Unforeseen was a book I won at a giveaway hosted by Michelle @ In Libris Veritas. This is one of those times when winning a book made me read a book I might not have otherwise. I’m wary of Vampire books, they have been overdone to death and have had all the blood sucked from them so they don’t have a lot of new ideas to bring to the table. But this one was a very pleasant surprise. I really enjoyed it, I won’t say it was unique but it is very readable. Alex while running home from work, gets attacked and ends up being rescued by vampires. She is resistant to their mind washing and badly injured, so they take her home to keep her safe and to find out why their powers don’t work on her. From there Alex is thrust into a world she knows nothing about but into a world where she already belongs. What makes this book work for me is the characters. Alex is realistic, tough and even a pain at times but always entertaining. The coven of Vampires all have their own distinct personalities, together they are just plain fun. They bounce off one another and I had more than a few laugh out loud moments. In particular the youngest member Rocky is like a little brother, you want to simultaneously hug him and slap him. The world building is slowly done. As Alex reads the histories, we gain an understanding along with her, we learn about the vampire powers and the different families. We are as confused as she is as to how it all fits together and especially where she fits in. She has trouble believing in vampires and her reaction to their world felt a lot less contrived than others I have read. My biggest issue is the relationship with Marcus, it happened a bit too fast. Insta-love is one of my pet hates and it does happen. Apart from that I really enjoyed Unforeseen. A story about friendship and loyalty set within a vampire world with all the action that entails with a few twists and lots of humour; what is there not to enjoy? Really looking forward to book 2 to see where we go to next. Bookish Chat : This is a book that proved yet again to me that I’m a character person. Are you more driven by plot or characters when reading? Obviously we need a bit of both but which is your preference? I know what you mean about the vampire thing. I’m like that with angel books right now. This sounds interesting. I definitely need good characters. If there is a character I love, then that alone can keep me reading. I’m a bit fearful of angel books too, they could never measure up to Daughter of Smoke and Bone. I agree, good characters grip me too and pull me along for the ride. This sounds interesting. I think I’ll give it a shot when I get my hands on it. Although, the insta-love is irking me a bit. But hopefully I can forgive it for the rest of the book. Thanks! Yes boo, hiss to that insta love! You don’t become soul mates after 1 meeting, instant attraction, yes but let’s build realistic relationships. Yeah, I’m always hesitant to pick up vampire books, and some of the things you mentioned only just remind me of the uber-popular vampire book (instalove, vampire’s power doesn’t work on MC). But I’m with you on the character! Characters can make or break a story for me. I have to care about them before I can care about what happens to them, otherwise moving through the story is reallllyyy hard. I’m with you Asti, if I don’t feel something for the characters, then I’m bored no matter how exciting the plot is. And I don’t mind if I hate the characters, I just have to believe they are real or I can’t connect. I’m glad you enjoyed it. I have the same hesitance with Angel books…I adore angels but it’s rare that I find a book that does them justice. I’m actually quite the vampire fan but I’m rather picky when I read them because I have read so many. I felt the same way about Rocky, there were times when I felt terrible for him and other times when he had me shaking my head. Too obvious! The pun lover in me would not shut up until I used it! Thanks so much, Trish, for taking the time to read and review the novel! I suppose it’s obvious from my writing that I’m a character lovin’ gal, but I’m also a huge fan of puns, so I really enjoyed your opening! And, good news, Rocky’s featured prominently in book 2, Unveiled, due out in May!